If you’re an educator, you’ll know that much has been written already about the madness of the “Pineapple Test Questions“. If you’re not an educator, the Pineapple Test fiasco relates to a very bizarre question that was included in a recent standardized test. The story and furor, known as Pineapplegate broke in New York when the test questions was leaked. Subsequently, details of poorly worded or factually incorrect test questions have been leaked in California, leading MORE public education stakeholders to finally begin to critically question the purpose, integrity, and implications of high stakes testing. 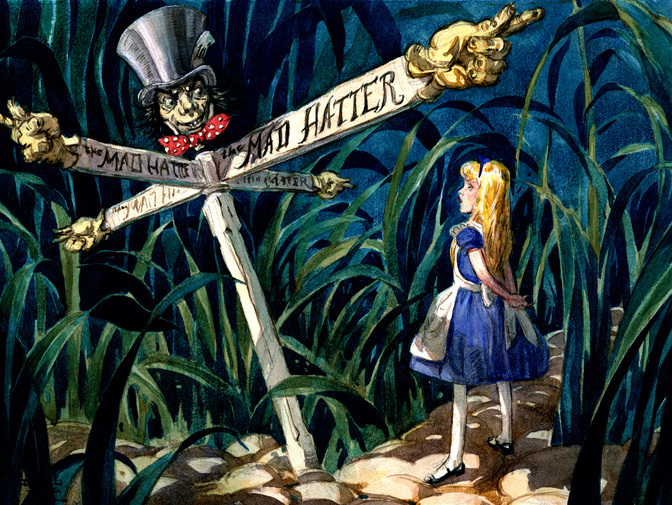 Are you spinning madly trying to keep up , and feeling as though you are falling, like Alice, into the deep dark hole of madness that is testing, Common Core, and edreform? 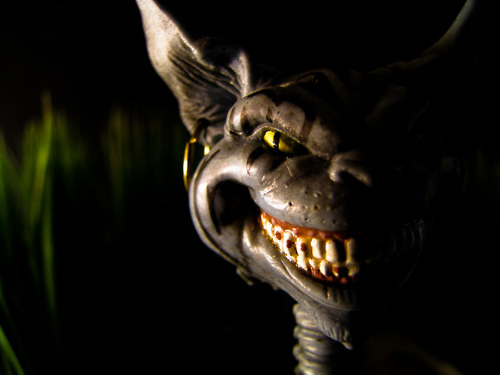 Who is leading America’s public school children down the rabbit hole of madness? I shrugged when the Obama Administration’s Department of Education was flooded with former Gates Foundation employees. I was unamused when Microsoft’s business partner, NBC News, had my FaceBook access blocked for criticizing their shameless publicity on behalf ot the Gates-financed propaganda film, Waiting for Superman. I tweeted in horror when I learned that the Gates Foundation was funding a scheme to put earpieces in teachers so they may be controlled while teaching. You would think that nothing else could surprise me, but now, Bill Gates has descended into the delusional world of Charlie Sheen. Gates told the nation’s governors (they seem to speak with Bill more than their caddies) that the critical cuts to public schools could actually improve education ifclass sizes were increased so that we can “get more students in front of the very best teachers.”That’s right, Bill Gates is now advocating for larger class size! Since when do philanthropists call for the deprivation of children? Gates’ crazy plan to raise class sizes FOR THE CHILDREN is one thing, but his desire to get more students “in front of the very best teachers” reveals his ignorance on how learning occurs. Learning is an active process constructed by each learner. It is not simply the immediate result of being taught. How did the madness begin? All this testing madness started in Texas with Senator Kress, Bush, Pearson, and No Child Left Behind. “Enter Sandy Kress, whom George W. Bush plucked from the Dallas School Board to help him apply the “You can’t manage what you can’t measure” mantra to public schools. It perhaps did not occur to Gov. Bush or Kress that Texas, which ranked dead last in per-pupil spending, might need to put more money into public schools. By punishing and publicizing failure, they reasoned, teachers and administrators would do more with less. The test scores became the only measure of how schools performed, and administrators and teachers became adept at preparing their students to pass the test. Book reports, dioramas, and lab experiments became a thing of the past as consultants instructed children on how to pass reading tests without actually reading the text. The testing madness creates an environment where American children are abused and oppressed to the point of endangering their health and safety. Senator Kress seems to have some personal reasons for his political positions on testing. Here’s a little scoop on but one of the shady lobbying recipients – Senator Kress of Texas, is paid by Pearson for lobbying. I include this to get the reader to IMAGINE the context, the sheer corruption of how much money is involved in promoting the testing and Common Core agenda! Senator Kress is feathering his nest via lobbying money. 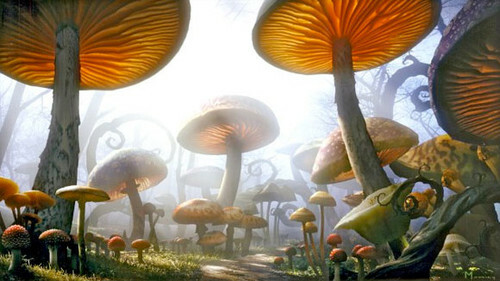 Keep in mind, Senator Kress’s pay-off is merely a drop in the bucket of lobby spending that occurs in the Pearson and Gates magic mushroom forest. $10,000 Pearson lobbying report (per quarter) in 2011 paid to Senator Sandy Kress, TX. $10,000 Pearson lobbying report (per quarter) in 2012 paid to Senator Sandy Kress, TX. Senator Kress isn’t the only one feathering his nest with education lobbying. So are many others through a mega-lobbying power called ALEC. 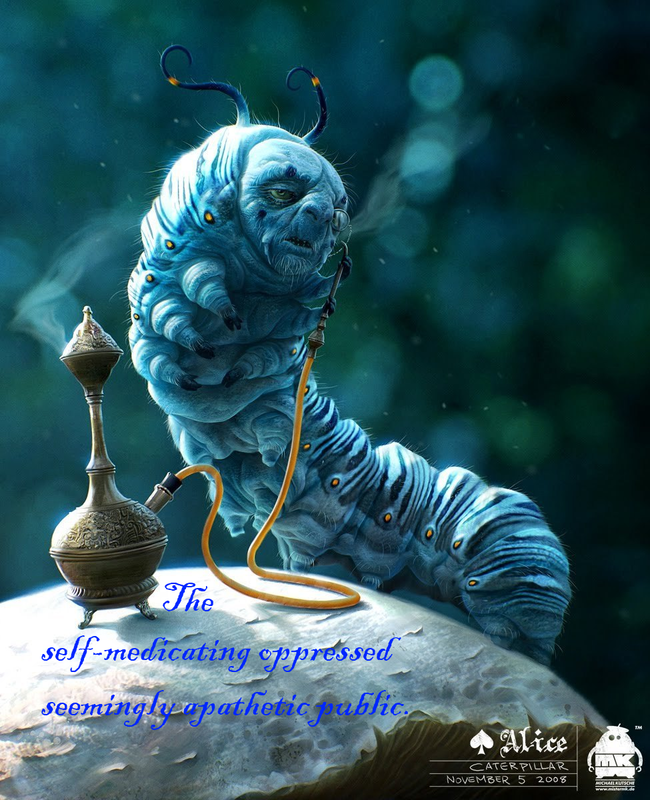 Lobbying through this organization called ALEC (American Legislative Exchange Council) has come under high criticism. Through ALEC and other corporate lobbying, the corporations are creating a system of government where people have less control over their government than ever before through powerful lobbying. Pearson is well connected to ALEC , but you have to dig deep to find their connections. The Gates and Pearson lobbying have had a huge impact on the madness of the testing craze. 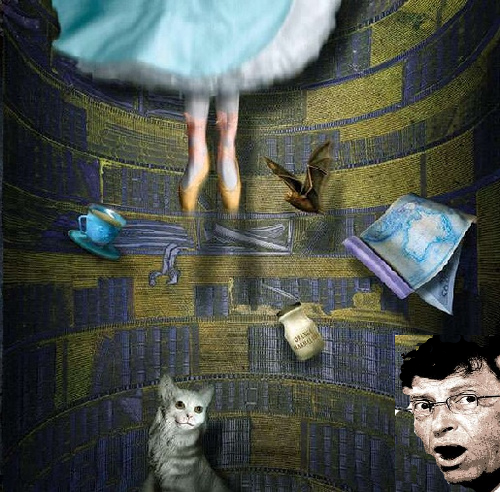 Bill Gates, and his company Microsoft are heavily involved as members of ALEC. The Gates Foundation granted nearly $350,000 to ALEC to push their education reform agenda through ALEC lobbies as well. The Gates Foundation may have broken the law, as we see here from Seattle Weekly. Microsoft offered no immediate elucidation. A spokesperson who pledged to look into the matter had no answers by the end of the day. Perhaps Microsoft took a cue from chairman Bill Gates, whose foundation has also been involved with ALEC. Last year, the Bill and Melinda Gates Foundation gave ALEC nearly $377,000, for education efforts–in particular, according to the foundation’s website, measures dealing with evaluating teachers, a favorite issue in reform circles. Earlier this month, however, as ALEC started drawing criticism from liberal activists, the Gates Foundation announced that it would no longer make grants to the non-profit. Microsoft could not or would not say yesterday whether it has followed suit. The ALEC Education Agenda comes with more and more testing. And with more and more testing we have more and more madness. The testing madness of the “pineapple question” is only a small bite of the madness. Testing errors are finally being made public. The increase in testing is proving to come with a whole new set of problems that America does not appear to be prepared to face. According to R.L. Ratto, error after error appeared on the tests, yet King (NY) blames teachers for the problems just like the rest of the edreformers. Who is really to blame? “According to King, we have it all wrong, it’s not the tests, it’s the teachers! What can we expect from a charter school advocate, with no real public school experience. So my questions are simple Commissioner King. Since our students have suffered through 6 grueling days of tests, and many teachers are now struggling to accurately score this garbage, who is responsible for the poor scoring instructions? Here is a good one.. Still more mistakes.. who’s fault? Let’s make it easy for you.. The Mad Hatter convinces them all to drink their magic potion. 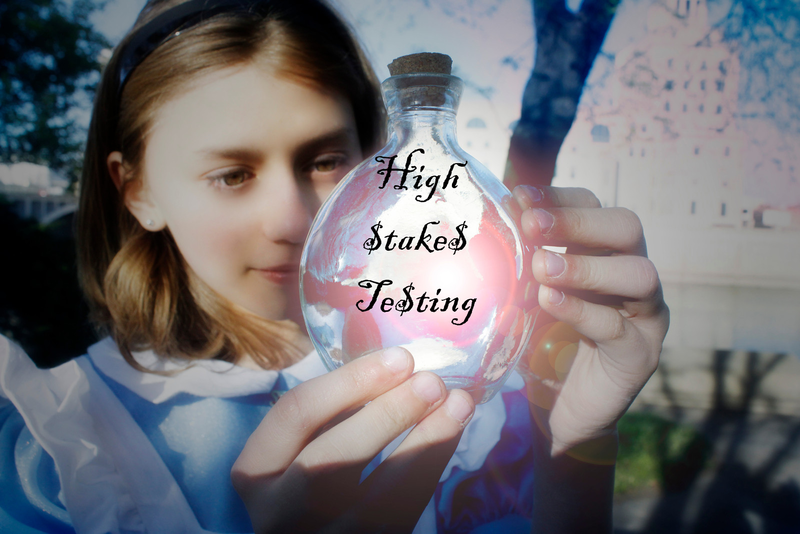 The magic potion of testing is sold to school districts through propaganda for a HUGE price, setting them up to fail. Gates and Pearson spin their propaganda, dizzying parents and politicos, convincing them of a necessary system of accountability, of a need for more standardized testing, and of a need for competition with other countries through a Race to the Top. 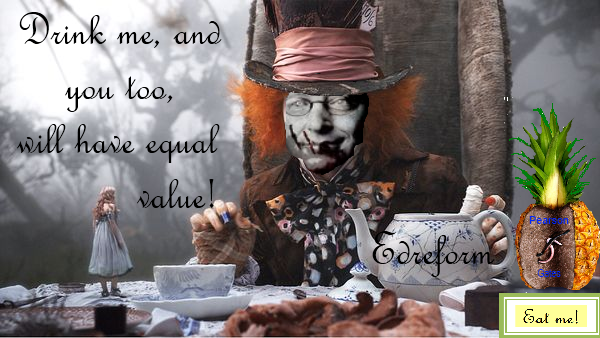 Preying on fear and competition, to take advantage of our children, the edreformers are successfully using the great strategy of divide and conquer. 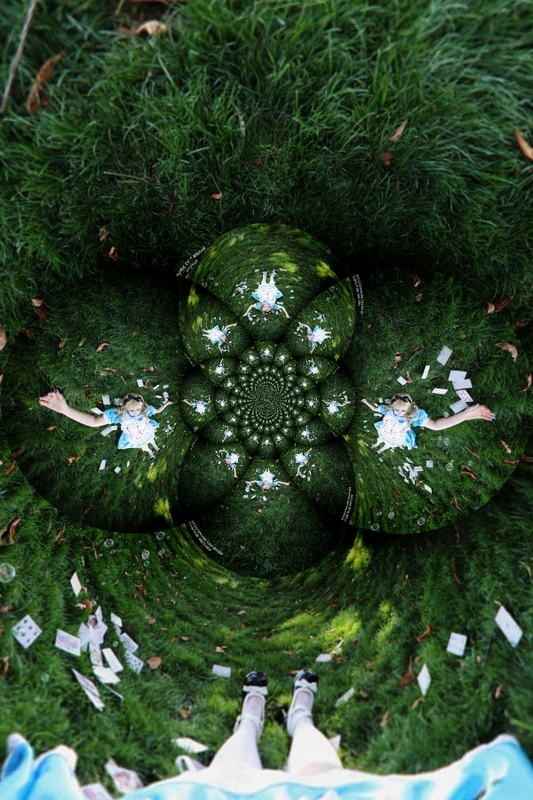 The dizzying effect is maddening. Most students, parents, teachers, and administrators are so seduced by the corporate education reformers and their consumer world of testing and materialism that has been set up for us, they don’t even realize what is happening all around us. And just as nicotine addicts craving cigarettes, it seems America’s education policy makers are will never be satisfied until all of our children are being tested all the time – and the big winner in that is test-dealing Pearsons. John wrote this in response after reading the provocative and appalling table of information uncovered by education researcher, Ken Libby. Are Americans addicted to Pearson and Gates’ high stakes tests? Testing has increased alarmingly since Kress, Bush, and Pearson decided there was money to be made in creating testing. No Child Left Behind increased testing. Race to the Top increased testing even more. Now Pearson and Gates have partnered to create online curriculum for Common Core that brings about an increased amount of testing. Corporate testing profits aren’t enough for Gates and Pearson’s voracious appetites. 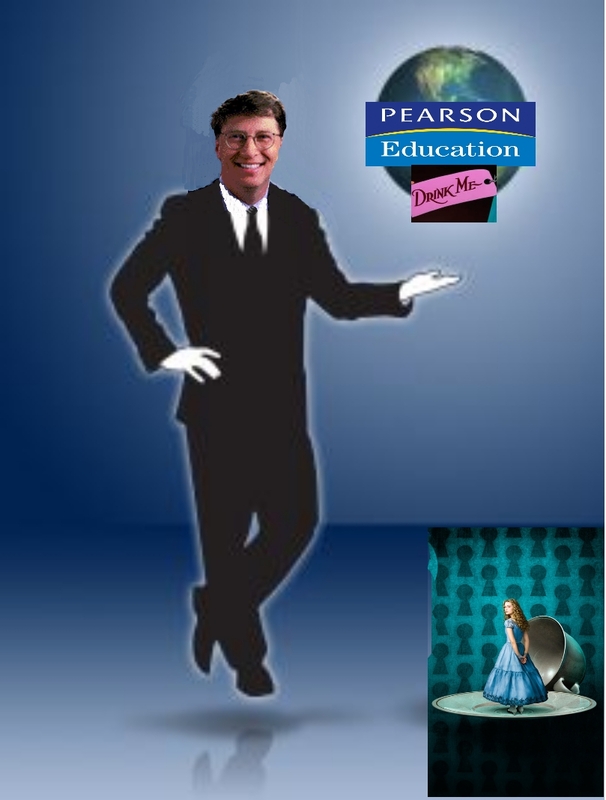 Pearson and Bill Gates partnered to create Common Core and Gates has stated he wants EVERY child to be learning from the SAME text book in EVERY subject. Imagine the profits! No Child Left Behind, Race to the Top, and now Common Core are leading to increased testing and increased costs to public education. Is the testing really doing any good? Is the “race” really making any difference in America’s chances for reaching the top of anything EXCEPT SPENDING? Why are American’s tolerating all this testing? Why aren’t they fighting back? Why has over 10 years of increased testing and privatization slipped by the American people without a fight? Are they being bullied? 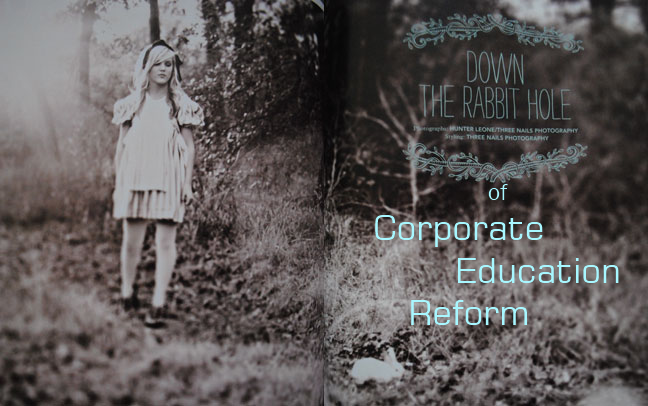 Through the use of carrots and sticks — punishments by No Child Left Behind and competitive grants through Race to the Top, public school stakeholders are bullied and bribed into high stakes testing while the test corporations become even bigger bullies. 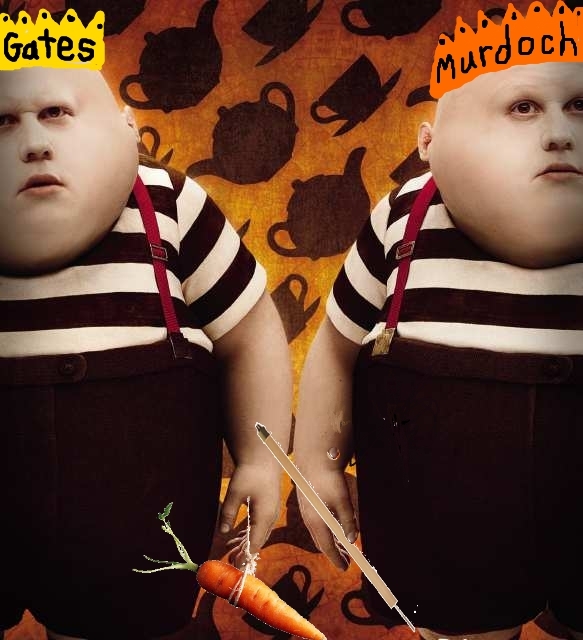 Gates and his partner Rupert Murdoch (of news media phone hacking scandal fame) along with his other partner Pearson, have their doughy hands in every single aspect of public education from Pre-K through Higher Education. They make money on children ESPECIALLY when they fail. Think about the grand scale of this for just one moment. They’ve invested in Pre-K and Kindergarten assessments, lobbying states to enforce standardized testing on pre-schoolers and kindergartners. They’ve cornered the market on high stakes standardized testing. They have cornered the market on remediation of students who fail the tests. They have cornered the market on retesting students and remediation/retesting a second, third, or fourth time — rinse, repeat. If a child fails the test in high school and is unable to graduate, Pearson and Gates have a GED program for them ready to go. They have SAT’s and other college assessments ready to profit from all aspects of testing in education. 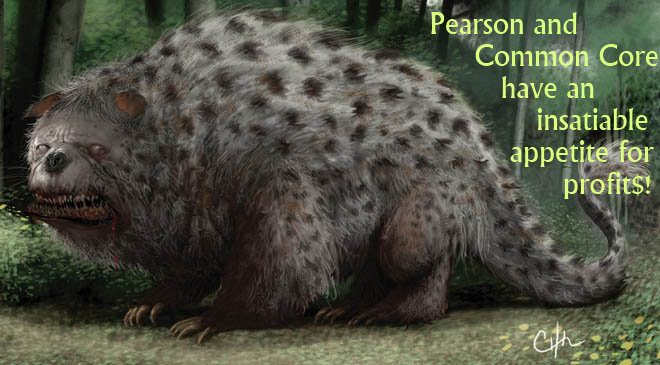 “Pearson is just one part of the picture, albeit a part about the size of Mount Rushmore. Its lobbyists include the guy who served as the top White House liaison with Congress on drafting the No Child law. It has its own nonprofit foundation that sends state education commissioners on free trips overseas to contemplate school reform. Winnie Hu shares the madness of money involved in this one contract alone in the same article. People, seriously, this is the amount of a contract in ONE STATE alone, giving Pearson and Gates the power over public schools that is abusing children and teachers through Common Core and the coming 20-fold increase in testing! What do Gates and Pearson stand to gain from the implementation of Common Core? What will implementation cost school districts? What is really behind the madness? Everything’s bigger in Texas, especially Pearson and their profits. “It is testing time for Central Texas students required to pass the state’s new standardized test to assess their academic readiness. And a battle over the entire testing system is brewing between the state, educators, parents and students. Rising costs surrounding state exams has been one of the big talking points among testing critics. “This has become a moneymaker,” said Ken Zarifis, co-president of Education Austin. You don’t have to be a mathematician to figure out testing three million Texas students a year isn’t cheap. “The overall cost is a large number. There’s no doubt about it,” said Debbie Ratcliffe, a spokeswoman for the Texas Education Agency. KXAN News has uncovered that the state is spending more than $89 million on testing for the State of Texas Assessment of Academic Readiness, or STAAR, this year alone. That amount has nearly doubled in the last 10 years. Every penny goes to a company called Pearson, which develops the test questions, prints and distributes test booklets and scores the exams before sending them back to 8,000 schools. The state’s five-year contract with Pearson, which covers the 2010 through 2015 school years, totals just over $468 million. What will it cost to implement Common Core Standards and the 20 fold increase in testing that comes with it? Who stands to gain? Students? Parents? Teachers? Society? Remember, Common Core “State” Standards (CCSS) are NOT field tested! Note: Graphic recreated to represent the same figures provided by The Pioneer Institute in billions. • All but five (5) states have committed to adopting the Common Core State Standards (CCSS) in English language arts and mathematics and are participating in one of the federallysponsored consortia developing aligned assessments (see Figure 1). Few of the participants, however, have carefully analyzed the costs involved. • Significant new costs are projected in three key areas of standardsbased reform: assessment, professional development, and textbooks and instructional materials. In addition, states and local communities are expected to face substantial new expenditures for technology infrastructure and support. 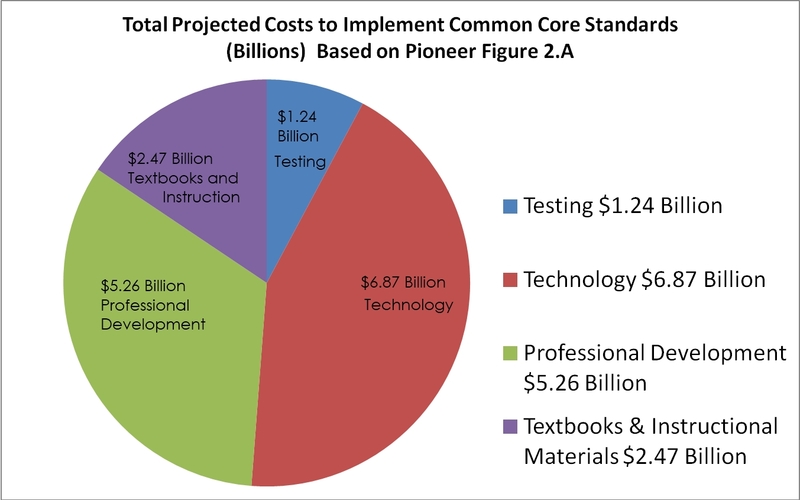 • Over a typical standards time horizon of seven (7) years, we project Common Core implementation costs will total approximately $15.8 billion across participating states. This constitutes a “mid-range” estimate that only addresses the basic expenditures required for implementation of the new standards. It does not include the cost of additional expensive or controversial reforms that are sometimes recommended to help students meet high standards, such as performance-based compensation or reduced class sizes. • Total, seven-year costs include the following additional expenses: $1.2 billion for the new assessments, $5.3 including increased assessment expense for some states as well as technology training and support. • In years two and beyond, annual operational costs are projected to be $801 million higher, including increased assessment expense for some states and the ongoing cost of supporting the enhanced technology infrastructure required for online assessment. • There is considerable uncertainty regarding future student testing costs. The two testing consortia, especially the Smarter Balanced Assessment Consortium (SBAC), also face considerable technical challenges to accomplish their goals. • California, a state with highly rated academic standards and a challenging fiscal climate, illustrates some tough tradeoffs. The state, a member of the SBAC, is projected to incur significantly higher state assessment costs of approximately $35 million each year. It’s going to get a lot worse. The US Department of Education is developing a massive new testing program, with far more testing than ever before, and they have made no secret about it. More grade levels to be tested: The new plan will require, as was the case with NCLB, tests in reading and math in grades three through eight and once in high school, but there is serious discussion of extending the tests to higher and lower grades. Extensive pre-kindergarten screening tests, a race to the top for tots. Adding interim tests and maybe pretests in the fall: The plan includes interim testing during the year, also, of course, linked to the standards, and may include pre-testing in the fall to be able to measure growth during the year. More subjects to be tested: In addition, the US Department of Education is encouraging standards and testing not only in reading and math, but in other subjects as well as well, including science, social studies, foreign languages, and even “performance” measures for the arts. So just who is responsible? Is it just one half of the Gates couple? 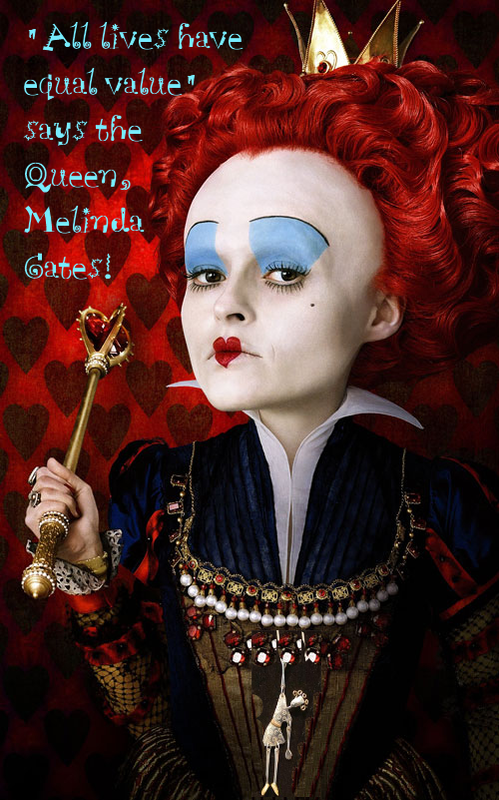 Or is it the Queen, Melinda Gates? 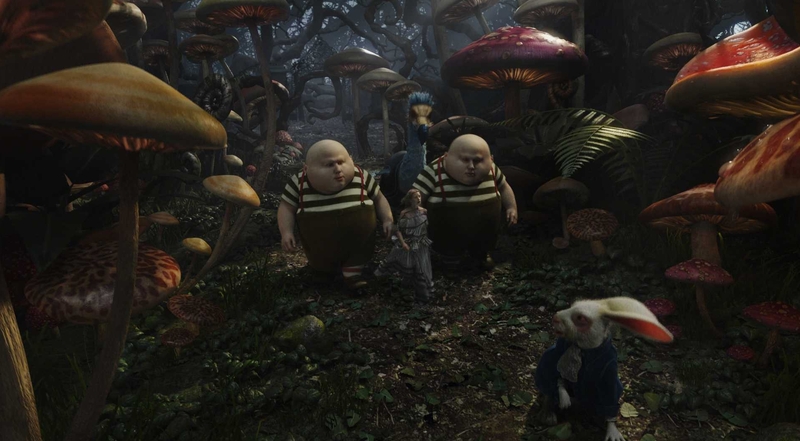 How does she fit into Wonderland? The Queen will appear soon on PBS News Hour to field questions on education reform. Here’s what PBS has to say about the involvement of the Gates Foundation. I wonder if this once progressive publicly run program will kowtow to one of its biggest sponsors? Since 1994, the foundation has spent over $6 billion in the United States, looking at data-proven ways to improve student achievement and often jumping into controversial policy debates such as smaller schools in New York City, charter schools, high-stakes testing and teacher evaluation systems around the country. Next week, Melinda Gates will sit down with PBS NewsHour CorrespondentHari Sreenivasan to talk about the Gates Foundation’s work in the field of education and we’d like to hear your suggestions. “PBS performs a great service to all Americans. I have a question for Hari Sreenivasan in preparation for this interview. Does PBS feel any constraints in asking hard questions of Melinda Gates as they are generously underwrite the NewsHour and the American Graduate Project? To the following questions which I have already asked, I will add this question: Should private non-profit foundations, especially those derived from corporate entities, have the ability to influence public policy through donations and grants to quasi-governmental entities? Isn’t this a form of under-the-radar lobbying? I question Melinda Gates about the Gates Foundation “looking at data-proven ways”… for an example, the Common Core State Standards that the Gates have invested heavily in by partnering with Pearson have not been field tested at all, and yet they are being swallowed whole by the entire country under the pretense that this is not a federal take over to appease the GOP. As long as they are keeping the fat cats happy, does it matter? The maddening test landscape may be changing before our eyes. Over 419 districts in Texas have passed a resolution against high stakes testing. One of these leaders in Texas is Superintendent John Kuhn. John is appalled at the damages done to children for a killing — pure profit for Pearson and Gates. “The video produced in Freedom’s television production studio also features School Board member Rick Roach, who wants to “stop the madness” of Florida’s high-stakes testing program. He proposed the video after visiting a Freedom remedial reading class filled with students who had failed FCAT. Roach thinks the Florida Comprehensive Assessment Test — a series of exams in math, reading, science and writing taken by nearly 2 million students each year — doesn’t accurately measure academic abilities, particularly reading. Susan Ohanian has had enough of the madness also. She says today that “With Bill Gates Money, David Coleman Takes Over the World”. What exactly is Gates’ money to Coleman going to do to increase the madness you might ask? One might ask why we are trusting these Pineapple Heads when it comes to the future of our children! Exactly what it is going to take. There you have it: David Coleman knows the answers. As it happens, he knows the exact answers. This must be true. Surely, if he didn’t have the exact answers, then NCTE, IRA, NCTM, ASCD, the PTA, the National School Boards Association, the NEA, the AFT, and a host of other organizations organized to educate children would protest. Since there’s not a word of dissent coming out of these organizations, then David Coleman and Partners must have the goods–exactly what teachers and students need. A word on David Coleman: Apparently, he achieved his expertise about exactly what schoolchildren need from tutoring students while attending Yale, taking some courses in English Literature at Oxford and Cambridge, and working for five years at McKinsey and Company. “I’ve broken some stories that I consider pretty important, had some pretty big headlines, but never anything like this,” Leonie said. Just tell me! Why are we trusting Bill Gates and these non-experts who are acting as experts again? 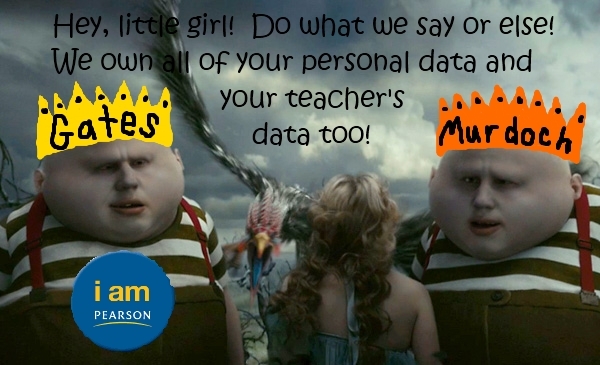 With the leaders in Texas and other states, there may be hope to escape Pearson and Gates’ Edreform Wonderland yet, as the cracks in the monopoly are beginning to form. New York’s attorney general is investigating Pearson for free trips they are offering. “New York State’s attorney general is investigating whether the Pearson Foundation, the nonprofit arm of one of the nation’s largest educational publishers, acted improperly to influence state education officials by paying for overseas trips and other perks. Are states and the Federal Department of Education breaking the law with Common Core? “A new report by former U.S. Education Department officials questions the legality of federal support for the Common Core State Standards Initiative, a set of education standards which critics say will lead to a national curriculum and tests. “The concern is that the assessments developed by the two Race to the Top-funded consortia will end up illegally directing the course of elementary and secondary curriculum across the nation,” said report coauthor Kent Talbert. The report from the Pioneer Institute for Public Policy Research carries weight because of its authors. Talbert is former general counsel for the U.S. Department of Education (DOE) and chief legal advisor to former Education Secretary Margaret Spellings, and Bob Eitel is a former deputy general counsel for the agency. Bill Evers, former U.S. Assistant Secretary of Education and now a Hoover Institution scholar, also contributed. “The paper establishes how, through the Race to the Top fund, the RTTT Assessment Program, and federal waivers of No Child Left Behind, the USDOE is pushing states to adopt standards and assessments that are favored by the Department,” said Pioneer Institute Executive Director Jim Stergios. Forty-five states have adopted the Common Core, which currently consists of grade-level math and language arts requirements. The Obama administration required applicants for Race to the Top grants and for waivers of No Child Left Behind’s most punitive provisions to adopt the standards. The report alleges tying these strings to federal favors shows significant federal involvement in implementing the Core nationwide. The organizations developing the Core and related tests are funded by the DOE. This consortium is also “‘helping’ states move to national standards and assessments, as well as developing ‘curriculum frameworks’ and ‘instructional modules,’” Stergios said. These actions, the authors argue, break three laws that prohibit federal involvement in curriculum: the General Education Provisions Act, the Department of Education Organization Act, and the Elementary and Secondary Education Act. Education Secretary Arne Duncan in February condemned such criticisms in his first direct statement on the controversy. The report’s authors flatly disagreed, citing federal law and the department’s actions contrary to Duncan’s statements. “Our greatest concern arises from the Department’s decision to cement the use of the Common Core State Standards and these assessment consortia through conditional NCLB waivers. It doesn’t have statutory authority to impose these conditions,” Eitel said. The Obama administration’s push for the Core effectively nationalizes the content taught in local schools, said Lance Izumi, senior education director at the Pacific Research Institute. “Strong-arming states to adopt national standards, national tests, and, very likely, national curricula goes against the Constitution’s intent that education policymaking reside at the state and local levels and goes beyond even NCLB, which still allowed states to develop their own standards and tests,” Izumi said. The Core is also likely to stamp out diversity within education, Evers said. “This uniformity in curriculum will stifle innovation and prevent states from competing with each other to have the best and most solid curriculum,” he concluded. Lindsey is an education policy analyst from The Heritage Foundation, a conservative foundation that promotes privatization of public schools via vouchers. While I typically HIGHLY DISAGREE with The Heritage Foundation, the law is the law. As a special education teacher, the high stakes and price children pay for standardization takes a toll too heavy for our nation to bear. 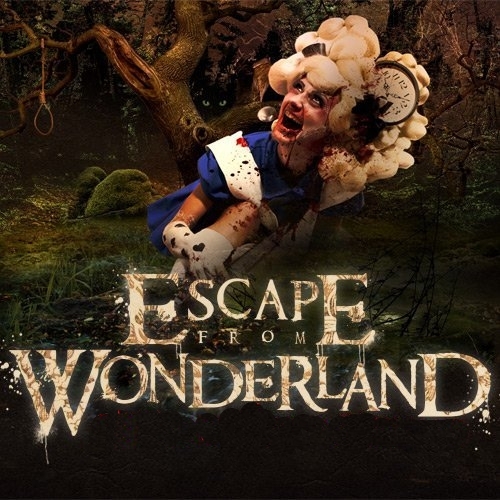 How do we begin to escape from Gates’ and Pearson’s Wonderland? We must stop the madness. If that means we must use the law to end high stakes testing and Common Core, then let’s use it. Parents can Opt Out of high stakes testing. School boards, principals, and superintendents can pass resolutions against high stakes testing. States and districts can use the law to fightback against forced implementation costs in the face of budget cuts. Teachers and districts can boycott Pearson. Teachers, unions, parents, and students can strike. EVERYONE can sign the National Resolution Against High Stakes Testing! This entry was posted on Monday, May 7th, 2012 at 12:28 am	and tagged with ALEC, American Legislative Exchange Commission, Bill Gates, Common Core State Standards, High Stakes Testing, Melinda Gates, Pearson, Pearson Publishing, Pineapple Questions, Pineapplegate, Profit and posted in A.L.E.C., All Lives Have Equal Value, Bill Gates, Carrots and Sticks, Common Core, Common Core Curriculum, Corporate Education DeFormers, Measurement, Melinda Gates, Public School, Race to the Top, Teachers, Uncategorized. You can follow any responses to this entry through the RSS 2.0 feed. « Good Night and Good Luck: Is Being a Public School Teacher REALLY Un-American, Mr. Gates? As gentle as one needs to be when discussing human behavior things like the mental condition of dictators of the past (some were in the end stages of brain Syphilus) have to be part of the discussion. Like any dictator, ruthlessly smashing competitors does not glorify someone into developing understanding into human relationships, certainly not on one of the precious relationships- student and teacher. Gates has Aspergers. He wants to “solve” his personal problem. We know it is through a kind of destruction using an equation as a kind of software robot which fires teachers. They almost passed that in Orange County Florida a few weeks ago. Which fires all the teachers under the newer contract in high poverty schools. . “My Boss is an algorithm.” He is an educated fool.